The region Bordeaux counts with Burgundy arguably one of the best-known French wine-growing regions, both of which compete for the first place in the category of "best wines". The town of the same name is the capital of the department Gironde with the same named mouth funnel in the southwest France and is referred to as one of the most beautiful wine towns in the world. The Greek historian Strabo (63 BC-28 AD) writes that he had found no viticulture about 20 AD on his visit to "Burdigala". But this is from his colleague Pliny the Elder (23-79) does not testify a few decades later. This means that the Romans around 50 AD here founded the wine. The current area Bordeaux belonged to 300 years England (1154-1453) and in this time the viticulture by the wine trade significant upswing to England and Flanders. This led to the establishment of numerous largely still existing large trading houses and the historically significant Bordeaux wine trade, From the end of the 17th century began in Bordeaux a large-scale vine planting especially in the Médoc, Due to these vineyard foundations, the name "Fureur de planter" (plant rage) was coined at that time. This laid the basis for today's vineyards. One of the largest winery owners was Marquis Nicolas-Alexandre de ségur (1697-1755). In 1925, the Agricultural Professor and deputy of the Gironde department put Joseph Capus (1867-1947) decisive initiatives concerning the controlled system of origin (see Appellation d'Origine Protégée ) in France, leading to the founding of the institute INAO (National Institute of Appellations d'Origine). The equation "Bordeaux is French red wine" is appropriate, because no other wine is (in addition to the Burgundy) associated with France as this. In most cases they are so-called cuvées, from several grape varieties blended wines (see Bordeaux blend ). Each Château (winery) has its own recipe of grape variety and vinification, which is carefully guarded. In Bordeaux, the Fassreifung in the small 225-liter barrels has been used for centuries and the Barrique brought to the highest perfection. In 1855, on the occasion of the World's Fair in Paris, a comprehensive classification of Bordeaux wines in quality classes. This famous Bordeaux Classification is still valid today almost unchanged. Bordeaux is synonymous in German with the entire wine-growing region, in the center of which lies the city, although the correct name Bordelais would. The area covers about two thirds of the Gironde department (only in the south and the sea there are no vines) with an extent of 105 by 130 kilometers and a vineyard of 113,000 hectares. The climate of the nearby Atlantic Ocean with the Gulf Stream and the many rivers is very favorable for viticulture. Summer is not too dry or hot, autumn is sunny and winter mild and humid. The predominantly barren and stony gravel soil causes the vine roots to dig ten meters deep into the ground to find water. As a result, both dry and rainy periods can be better overcome. The stony soil favors the drainage and also serves as a heat storage. The large area is from the south through the rivers Garonne and Dordogne traversed. These unite below the city Bordeaux to the large mouth funnel Gironde that divides the area in the north into two areas that are also best known. 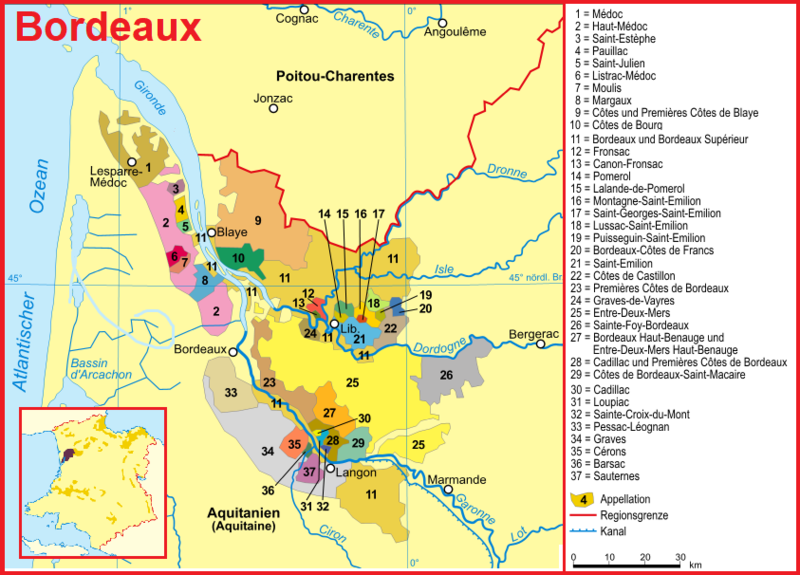 These include the appellations Blaye - Cotes de Bordeaux, Cotes de Bourg, Fronsac, Pomerol and Saint-Emilion (also as Rive droite Médoc, Graves and Sauternes (also known as Rive gauche designated). Especially the southern part of the Médoc (Haut-Médoc) is called the showpiece of the Bordelais. There are also significant differences in the grape varieties. One often speaks of a typical one Bordeaux blend, but there are different forms. On the left side dominate the red wines Cabernet Sauvignon, followed by Merlot and smaller shares of Cabernet Franc and Petit Verdot, The right side is the domain of the Merlot, followed by the white wine varieties Sauvignon Blanc and Sémillon, The two Cabernet varieties contribute to the tannin, the Merlot yields softer wines. The three main red varieties account for 90% of the red varieties. For white wines, Sémillon is the most important variety at over 50%, followed by Sauvignon Blanc, Colombard. Muscadelle and Ugni Blanc ( Trebbiano Toscano ). The importance of viticulture testifies in an impressive way that wine is produced in over 500 of the 542 municipalities. Basically, every winery, regardless of the size, the structural condition or the quality of wine there pressed, as Chateau (Lock) designates - in not few of them are however actually castle-like buildings. The widespread family empire of the Lurton is the largest owner of wineries. It produces almost exclusively AOP wines (98%), over a quarter of France comes from here. This makes Bordeaux the world's largest area for quality wines, Much of it is marketed under the comprehensive regional designations. This applies to all AOP wines from the Département Gironde.